We are the experts in the local area and work hard to ensure that our clients are treated with care and respect during what can be a stressful time. We understand the importance of selling your property to the right buyers, for the right price, in the shortest possible time. 1. Book a Free Valuation - Arrange a date and time for our one of our experienced valuers to visit your home. You can book an appointment on line or call your local office directly. 2. Local Expertise - We will give you an honest and professional valuation and offer you advice and expertise on how to get the best value from your home, all with no obligation. Our highly trained team all have an in depth knowledge and experience to assist you with all aspects of your move. 3. Energy Performance Certificate (EPC) - All properties require an EPC when going onto the market. EPC's last for 10 years so if your property already has one in place we can reuse it. 4. 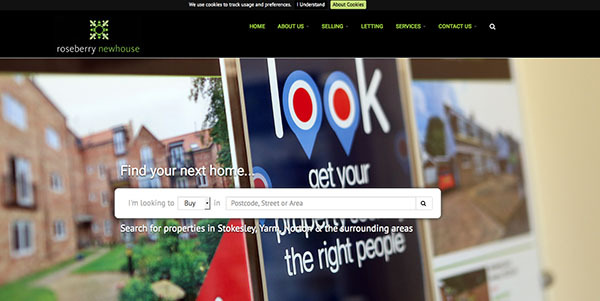 Marketing - We plan a marketing strategy with you including quality photography, floor plans and sales details. Once they have been approved by you we will market your property to our extensive mailing list, distribute our Ezine to 1000’s of buyers and promote your property on our website and leading property portals reaching thousands of prospective buyers. 5. Communication - We will give you regular viewing feedback and advice on presenting your property to create the best first impression and inform you of all offers both verbally and in writing. 6. Conveyancing - We would advise instructing a solicitor as early as possible in the process to save delays once a sale has been agreed. You can instruct a solicitor through Roseberry Newhouse Conveyancing on a No Sale No Fee basis. For further information and a personal quotation please speak to a member of staff. 7. Support - Once you have accepted an offer on your property our dedicated Sales Progressor will guide you through the conveyancing process liaising with solicitors, buyers, surveyors and other estate agents in the chain. Around 35% of sales in England and Wales fall through however our Sales Progression reduces this substantially by spotting potential difficulties long before they arise and by spending 100% of their time working towards a successful outcome for our clients. 8. Removals - We can assist you with removals quotations to ensure everything is organised for your moving day. For more information follow the link on our website. Watch our helpful guides to all things selling or buying.